James Garfield was the 20th President of the United States who served in office from March 4, 1881 to September 19, 1881. What was the life of James Garfield like? The short biography of President James Garfield covers important information and facts about his early life, his family, career and the famous events and achievements of his political life. Our short biography of James Garfield provides an interesting and easy way to learn about the life of the President. The following important facts provide a fast overview of important facts about President James Garfield. Facts and Info: James Garfield was the 20th president of America. His presidency was short-lived due to an assassination attempt on on July 2, 1881, which led to his death. For additional info refer to 20 Facts about James Garfield. Facts and Info: He was born on November 19, 1831, in Orange, Ohio. His father, Abram Garfield was a wrestler and died when Garfield was just 17 months old. Garfield was the last of seven presidents to be born in a log cabin. James Garfield died on September 19, 1881, in Elbberon, New Jersey. Facts and Info: The career of James Garfield included the roles of Preacher, Teacher, Lawyer, Politician and Statesman. He was born into poverty but received a good college education, served in the Union army during the Civil War and became the 20th President of America. His term of office lasted for just 200 days in 1881 from March 4th until his death on September 19th. Facts and Info: James Garfield was married on November 11, 1858 to Lucretia Rudolph Garfield and had 5 children. 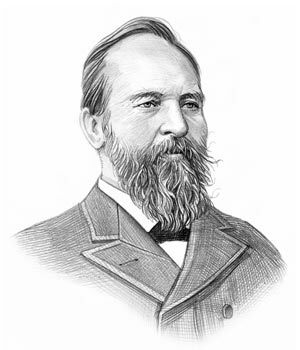 One of their sons, James R. Garfield, followed his father into politics and became Secretary of the Interior under President Theodore Roosevelt. Facts and Info: James Garfield belonged to the Republican Political Party. He was 49 years old when he was inaugurated as the 20th president. He was an extremely religious man and had been a Preacher which led to his nickname of the Preacher President. James Garfield's single executive order was to provide government workers the day off on May 30, 1881, in order to decorate the graves of those who died in the Civil War. Chester A. Arthur stood as Vice President. For additional facts refer to his Presidential Cabinet members. Short Biography of James Garfield: What he was like! Facts and Info: James Garfield was 6 feet in height and weighed approximately 185 lbs. He had light brown hair, blue eyes and wore a full beard. He the first left handed president. He was born to a poor family and became a hero of the Civil War. James Garfield was the poorest man ever to have become President of the United States. Facts and Info: His presidency was short-lived. James Garfield was shot by Charles J. Guiteau, a disgruntled Republican. One bullet grazed his arm and a second bullet was thought to be lodged in his spine. Doctors probed his wound with dirty, unsterilized fingers whilst trying to locate the bullet. The president bedridden in the White House and was in considerable pain. Alexander Graham Bell devised a metal detector to find the bullet, but the device's signal was distorted by the metal bed springs. The bullet was never found and infection caused death by blood poisoning. The short biography of James Garfield provides a fast overview of the key facts and events about his life and the accomplishments of his presidential term in office. The following James Garfield video enables you to sit back and listen to the history of his personal and political life - a useful educational resource for kids, children and schools learning about the life of President James Garfield.